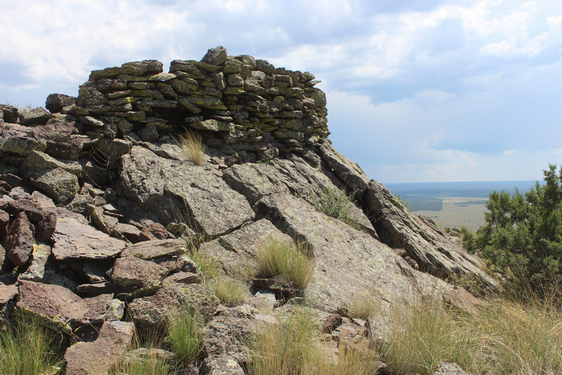 Chevelon Butte is a prominent landmark about 30 miles south of Winslow. I was in the area to see what was on the butte and to check out a couple of old ranch sites on Clear Creek a few miles away. My original plan was to drive to each of the sites. That did not quite work out. Because of road closures, it was necessary to walk into two of the places. This is a view of Chevelon Butte looking south from Highway 99 out of Winslow. I spent the night before the drive to the old ranches camped near the historic Wallace Ranger Station. It is several miles south of Chevelon Butte. By sunrise the next morning, I was already on FS Road 23 headed for the Clear Creek rim. There are quite a few roads west of Chevelon Butte. Fortunately, most of them appeared in my gps software and I was able to make the correct choices at each of the road forks that I came to. Those roads were on the National Forest. Apparently the ones to the north, on the O'Haco Ranch, are only open during the fall big game hunting seasons. Progress was slow. The roads are not well-developed. There were many rocky stretches to navigate. It was a good thing that the tracks were dry. There were sections that could be very challenging if wet. I enjoyed seeing the San Francisco Peaks in the distance. After a few miles of travel, I came to the end of a road at the canyon's rim. There was a dilapidated wooden fence, and a concrete and rock water tank. In a stand of Juniper trees nearby was a 3 room wooden cabin. I do not know the history of this place. A date of 1918 was scratched into the concrete of the tank. The nearby O'Haco Ranch, which dates to the same era, began as a sheep raising endeavor. Perhaps this operation on the rim had a similar history. The interior of the cabin is in a state of disrepair. But, it doesn't seem that it would take a tremendous effort to salvage the old building. Just a few yards west of the old ranch site is the drop off into East Clear Creek Canyon. I have hiked into the canyon at several locations upstream from here. And I have paddled up into the canyon from Clear Creek Reservoir several miles downstream. I am not sure that the bottom of the canyon is accessible at this location! This section of the canyon is extremely rugged. The maps do not show any established trails (foot or pack) into the canyon from here. My second objective along the rim was several miles north of this site. The map showed that it could be accessed by backtracking a short distance to a fork in the road. The other two-track headed in the correct direction. When I came to the fence marking the boundary between the Forest and the O'Haco Ranch, the gate across the road was wired shut. A game and fish department sign noted that foot traffic was allowed onto the ranch. So I crossed through the fence and walked about a mile on to the second place. This old auto body was seen along the way. There was no frame or running gear. There were no markings that I could see to identify the car. Not a lot remains at the second old ranch site except for a massive stone fireplace. There is essentially nothing left of any cabin. The fireplace is butted against a low concrete and stone water tank. Its hearth is a large block of ripple marked sandstone. With very little to look at around the old ranch, I walked the rim downstream. This rattlesnake did not appreciate my intrusion! After my encounter with the snake, I came across this old auto frame near the lip of the canyon. It looked as if someone was going to use the frame as part of a winching machine. It was not anchored to the rock. I could see nothing over the edge to indicate that system had ever been put into operation. Just as at the first site, the view into the canyon was impressive. The canyon sides were not any less rugged! I was surprised at the amount of water. Chevelon Canyon to the east had been completely dry! I had budgeted two days for this adventure. A trip to the top of Chevelon Butte was on the agenda for the other day that I was going to be in the area. My older Forest Service map showed a road going to the top of the butte from the south side. My original plans were to take a quick ride to the top to look around. At one time there had been a fire tower. The forest map shows a radio tower. What else was there? My plans for getting to the top of the butte changed when I arrived at the intersection of FS 23 and FS63 near the base of the mountain. FS 23 was obviously abandoned north of that junction! It appeared that if I was going to the top it was going to have to be on foot. Fortunately, that was not an issue. 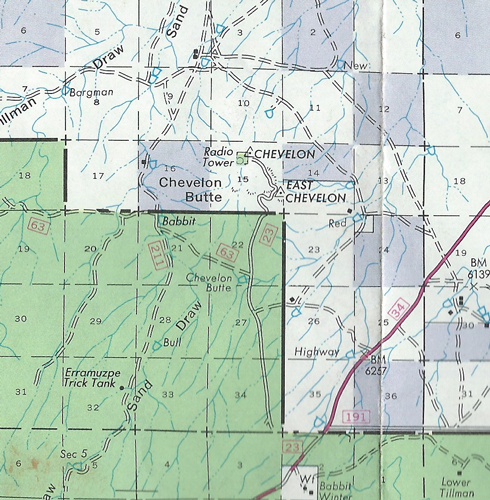 The white coloration of the area of Chevelon Butte on the Forest Map indicates that it is privately owned. With Forest Road 23 abandoned, I was not certain what the access issues to the mountain were going to be. It did not help that the sign was missing from the post at the "Trailhead". Fortunately, up the old road there was a sign identical to the one that I had seen over on the Clear Creek rim that said that foot traffic was permissible. Soon after the sign, the abandoned road bed intersected a modern service road that continued on to the top of the butte. The rocky knob to the east was very interesting in that there was a man-made wall on its butte facing side. It appeared that the wall had been constructed to restrict access onto the knob. Had the wall allowed the knob to serve as some sort of defensive position for early inhabitants? There was a geological survey monument embedded in the rocks beyond the wall. At the shoulder of the butte across from the knob was an old quarry. There was evidence that a crusher had once been set-up there to process the excavated volcanic rock materials. There were great views off the butte to the plateau below. 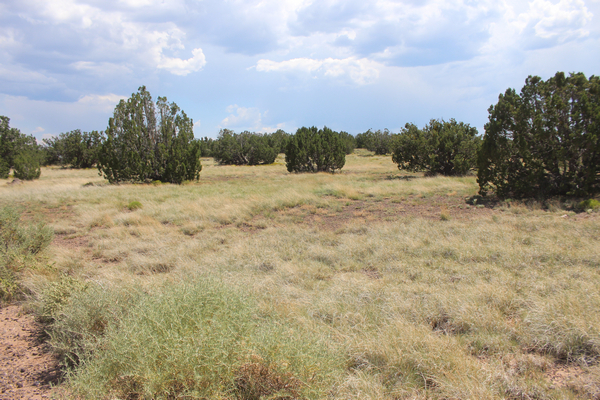 This is looking south toward the Mogollon Rim. My truck was parked near the stock tank in the center of the photo. The road to the left is FS23. The top surface of Chevelon Butte is quite level and rock free. It certainly appeared to be an inhabitable space. The weather became more threatening soon after I arrived at the top, so I hurried to see what I could from the road before retreating. There is a small cemetery up on the butte. Mr. Michel "Mike" O'Haco one of those buried there is the son of the founder of the O'Haco Ranch. The first Mr. O'Haco, a Basque sheepherder, set up his own operation near Chevelon Butte in the early 1900's. 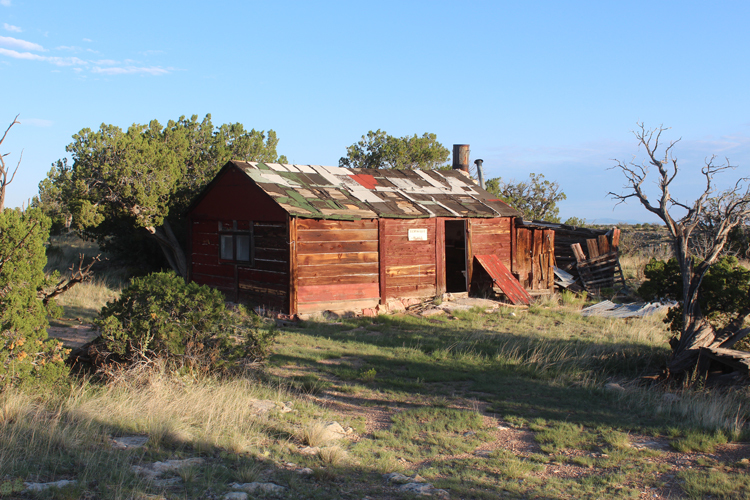 Through the years, as other homesteaders and ranchers in the area were not able to make a go of it, their properties were purchased by the O'Hacos and incorporated into the O'Haco Ranch. In the 1940's, the O'Hacos switched to cattle ranching. The O'Haco name is associated with many landmarks of the Mogollon Rim. 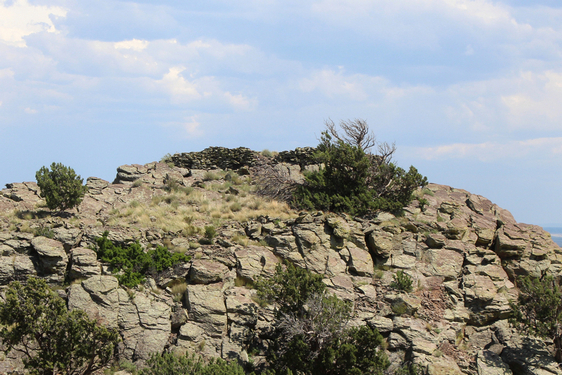 I am not certain whether the sections of "tower" seen on the butte are the remains of the old fire tower or not. Was what appeared to be an underground tank an old cistern? There are two sets of communications equipment on the butte. This installation is at the far west end 2 1/2 miles from the FS 23/FS 63 Intersection. From a vantage point near the towers, several buildings could be seen to the west and northwest down on the plateau. As I hurried back to my truck, I wondered if there might be a chance to drive out there and see what they were about. After returning to my vehicle, I drove around a bit and came to a road heading north onto the O'Haco Ranch. There was a very interesting sign near that gate. What good luck! My timing had brought me to this area just as the window for access was opening! I filled out the sign in sheet and took one of the passes and drove onto the ranch. The roads that I drove essentially took me full circle around Chevelon Butte past the buildings that I had seen from up on top. I exited the ranch on the east side at Highway 99. I do not know the history of any of these buildings. Were they constructed by the O'Hacos or by the ranchers/homesteaders who had come before? Marks in the sides of the logs left by the shaping tools can still be seen in the photo below. This map shows the extent of the O'Haco Ranch. Each square is a section of land that is 1 mile x 1 mile. Vehicular access is not allowed inside the areas outlined in red. The last stop before leaving the area was at a site three or four miles southeast of Chevelon Butte. The Forest Service Map showed that there was a building at a place called "Lower Tillman". This is what remains of the building today. Lack of reliable water sources in the Chevelon Butte area had done in many of the early ranchers and homesteaders. Had that been an issue at this site?